Description of Attraction: This beautiful lighthouse is built right into the cliff face, and almost appears as a natural feature of the landscape. The granite tower stands thirty-four feet tall and flashes a red light every three seconds. There are wooden steps descending from the path. There are also steps carved into the stone on both sides that go down to the water. Location Address: The path to the lighthouse is located at the back of the parking lot for the Castle Hill Inn at 590 Ocean Ave. Parking: The parking lot is usually attended by the hotel staff. If you tell them you are there to visit the lighthouse, they will ask you to park at the back of their lot. Trail/Hiking Time: The wood chip trail starts at the end of the parking lot at the corner closest to the ocean. You will hike on the path through low bushes and will not have a view of the lighthouse or the ocean. In 8-10 minutes you will see an opening to the right and the top of the lighthouse. You can descend the steps and cross onto the rocks in either direction. If you are going south of the lighthouse, you may want to continue on the path until the next opening for an easier access to the rocks. Location #1: This picture was shot close to the ocean, but up on some rock slabs looking north/northwest. 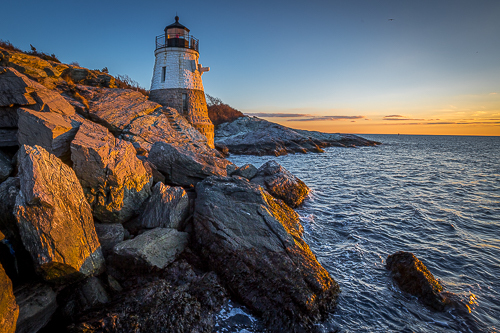 Castle Hill is one of the few lighthouses in New England that is a great sunset location rather than at sunrise. Best time of day to visit: Certainly the hour before and after sunset is excellent. Best time of year to visit: Any time of year works. In winter, the sun is in the southern sky and the lighthouse is best shot from north to south (see below). In the summer with the sun in the northern sky, the best shot is from south to north. I prefer this view due to the position of the lighthouse in the rock ledge and also the multiple angles afforded from the south side of the lighthouse. Best type of light/weather: Infinite number of choices here as the elements of the location are very strong and adding the components of weather and light is your choice. I have added some additional shots from an hour before sunset and a half hour after sunset. Additional Equipment Needed: I strongly endorse TPE (The Photographer’s Ephemeris) App for planning your shot. A tripod, polarizing/neutral density filter and shutter release are needed. I also like a good pair of shoes for navigation on the smooth rock. I would also bring a flashlight or headlamp. Additional Information: This site has many more photo opportunities from either side or above. Be very careful navigating the rocks as they are steep in certain locations. While it is obvious that the area next to the ocean can be slippery, it is worth repeating that as the tide goes out, this smooth rock becomes like ice and can easily deposit you and/or your gear into the Atlantic.